funded by a generous donation from Christine Laffer. How does a country of weavers bound by the weight of tradition, both technical and visual, shrug off this all-consuming weight and emerge receptive to new possibilities? In recent years in France, traditional techniques that stretch back five centuries have been utilised to create bold new adventures in tapestry in an unparalleled way. It is a great credit to the weavers, trained skillfully in methods that are centuries old, that they are willing and able to rise to challenges and to accept new concepts in creating tapestry. 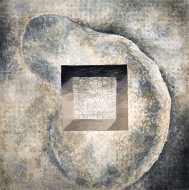 In part, this transformation has been fueled by the need to survive, but for the most part, it is an acceptance of being recharged by an injection of visual ideas that have not only capitalised upon their time-honoured skills, but have turned those skills into a new vehicle of artistic expression. At the forefront of charge is the town of Aubusson, the small, beating pulse in the heart of France that has sustained the lifeblood of tapestry weaving since the 15th century. Throughout time, this town’s individual ateliers and small workshops have competed with larger cousins in Paris and Beauvais to fulfill grand commissions and to play a prominent role in tapestry weaving’s 20th century revival. Aubusson weavers were responsible for bringing design masters such as Lurçat and Dom Robert to prominence, who in turn modernised the medium and saved it from subservience to the production of utilitarian items, such as upholstery and fire screens, during the previous century. The first Unicorn tapestry woven at the end of the 14th century. When designing a tour for practitioners of this wonderful art, I was delighted to select the most acclaimed suites of tapestries in Europe to view and savour, always knowing that the sojourn must finish in Aubusson, where tapestry has been practiced for centuries to become synonymous with a way of life. With skills passed from the hands of one generation to another, Aubusson tapestry weaving had been similar to breathing or eating, sustaining the very fabric of existence. 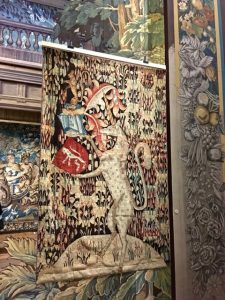 But things were about to change, and I have had the privilege during the past seven years of witnessing the tapestry industry’s regeneration in Aubusson. Susanne and I became firm friends and have championed these changes by facilitating tours of weavers from Australia, the United States and Canada to Aubusson, and building awareness of the special place it occupies within tapestry weaving’s history. In 2009, Aubusson and Felletin (another small weaving town located a short distance from Aubusson) tapestry received the title of Intangible Cultural Heritage from the Convention for the Safeguarding of the Intangible Cultural Heritage, UNESCO. With funds received, the Cité Internationale de la tapisserie et de l’art tissé was created. The title was a local and national effort to save this art form that for too long had been neglected by local authorities and to some extent by weavers themselves. As sons and daughters of weavers grew up, they had moved away from the town to seek training and employment in industries that would earn them a living. The Cité appointed a Director, Emmanuel Gérard, and a curator, Bruno Ythier. A new training course for weavers was launched in November 2010 (the former having been closed due to lack of funds and interest) for which 10 students were accepted and, most importantly, an International prize competition was established for artists to create design cartoons for tapestries to be woven by local ateliers. 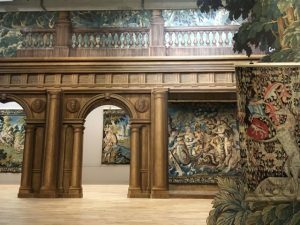 When woven, the tapestries became part of the Cité contemporary collection and a showcase for encouraging designers and architects to place orders for Aubusson tapestry. Now in its eighth year, this effort has revitalised both the industry and community. The former art school building has been transformed into an innovative, dynamic gallery space that shows the Cité collection from Mediaeval to Modern, and breathes new life into the work by a display meant to contextualise and celebrate tapestry through the ages. 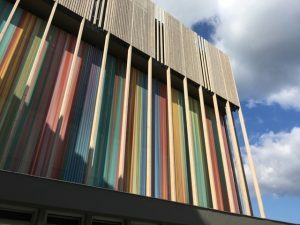 As well, the building is home to the now-growing collection generated by the design competition, a group of daring works that stretch the imagination and reflect the weavers’ talent. Traditionally, French tapestry development has relied upon organised, commercial studio activity, where the weaver is in service to the designer or painter of an artwork. 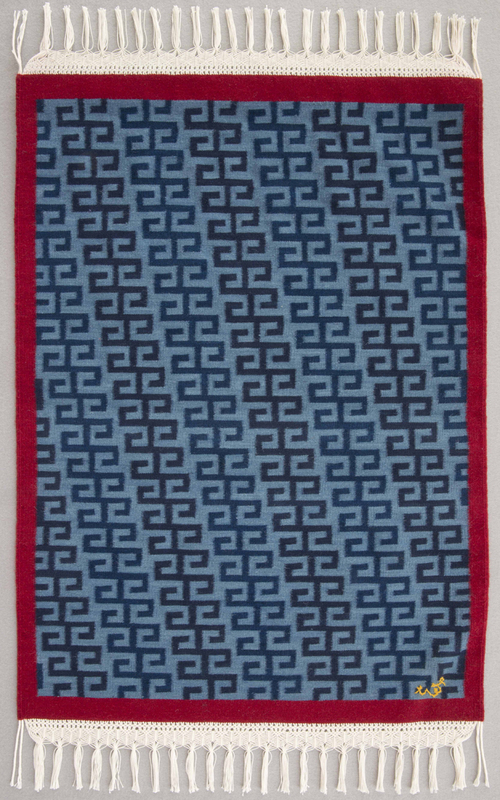 Tapestries are woven on horizontal, or basse lisse (low warp looms). It’s not surprising that some current breakthroughs in contemporary tapestry have been created through this formalised process, rather than just through the work of individual artists who weave their own work. Nadia Petkovic is a fine example of an artist drawn to and developed by Aubusson tapestry regeneration. 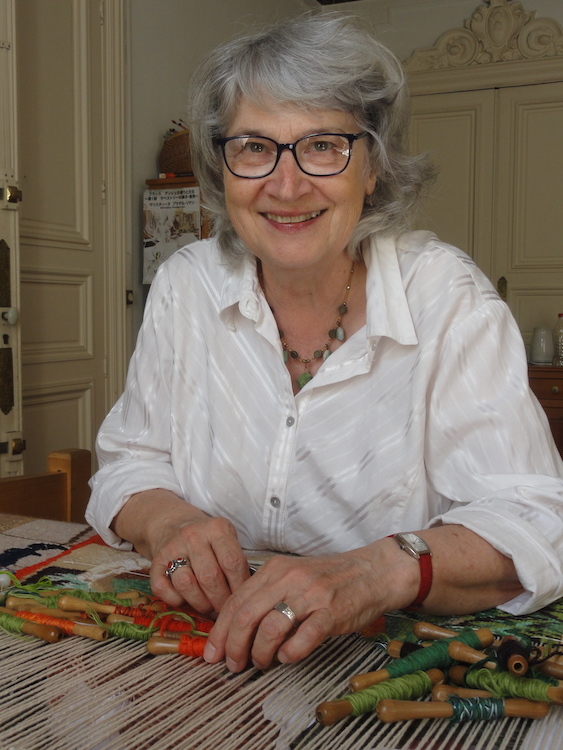 She arrived from Paris specifically to undertake the Cité’s recreated course in tapestry weaving, and after graduating, set up her own studio, Atelier de la Lune, and began receiving Cité commissions. Very early on, she wove the masterwork Nouvelles Verdures d’Aubusson, the winner of the 2013 Grand Prix designed by Goliath Dyèvre and Quentin Vaulot. This suite of five exquisite contemporary tapestries reference the traditional verdure tapestries created during the 16th to 19th centuries, and are displayed with ceramic overlays that symbolise the effect of a now-degraded environment upon nature. Nadia was able to study original verdure tapestries in the Cité collection, noting and interpreting in detail the method in which flowers and leaves were rendered through the play of light and shade upon natural form. Nadia has gone on to produce more adventurous commissions that rely upon textures and incorporation of unusual fibres. 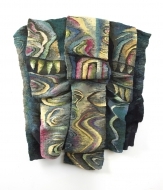 “In my studio I’m specialising in weaving contemporary artists, so that every work is a new technical challenge. Every artist has his own language for which I have to find a corresponding method in textile tapestry technique. And that is what is really exciting. Last year I was able to view a special exhibition, Seven years of Creation in Aubusson, at the Centre Jean Lurçat, Aubusson. 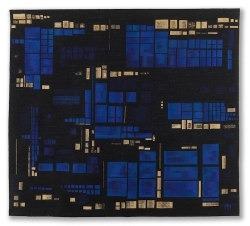 These seventeen tapestries have been created since 2010 and comprise the 21st century commissions that form the basis of the Cité’s Contemporary collection. I have selected some of these tapestries to illustrate this text. As well as the great leaps forward made by the alliance of weavers and visual artists, there are some individual artists/weavers who run their own studios and design and produce their own designs. Although in the U.K., Australia, America and Canada this is typical practice, as tapestry weaving has been taught alongside other disciplines within an art school environment, it is rare in France, where weavers have been educated through long apprenticeships within formal workshops. Amongst these weavers, the most recognized are Marie-Thumette Brichard who lives and works in Brittany, and Christine Pradel-Lien, who has her studio in Angers. I have had the pleasure of visiting Christine during my annual tapestry tour and delighting in her very personal, biographical work and her warm personality. Christine spent many years living in the United States with her American husband, and I’m sure that ATA members will be very familiar with her work. Christine interprets her intense observation of nature – from an iridescent drop of dew on a leaf to a filmy spider web – with dedicated pleasure and delight. The very small and particular become grand subject matter within her sensitive interpretations. As well, there are odes to her beloved Angers – the beautiful parks, fountains and intimate spaces that surround and support her practice. 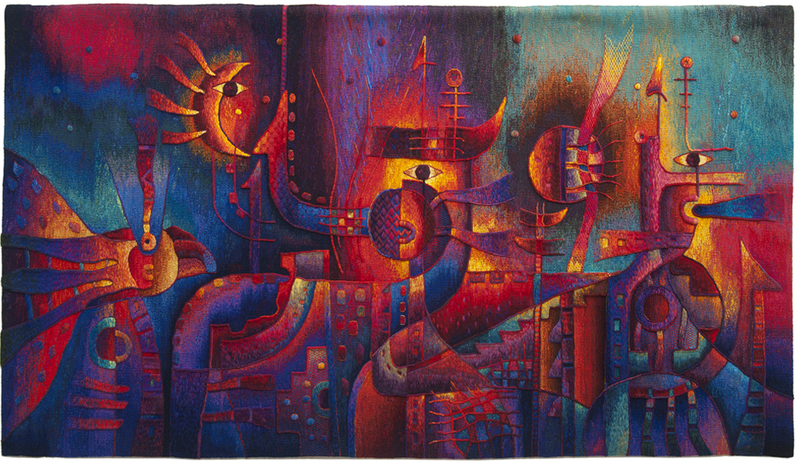 Marie-Thumette Brichard’s tapestries have long captured my attention, although I have not yet met her personally. 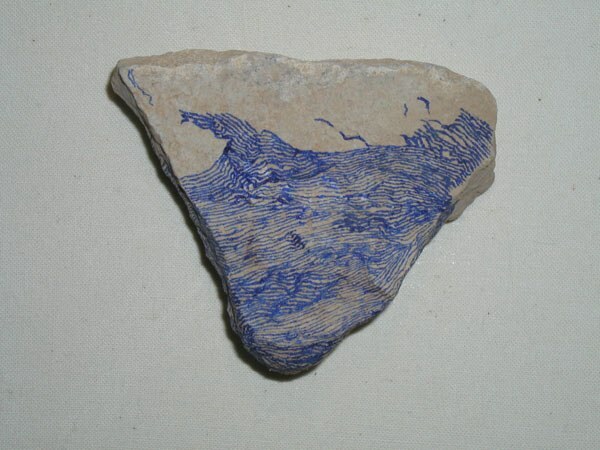 Her broad strokes of vivid blue are made as direct homage to the sea and her proximity to its force, as she lives and weaves close to a coastal environment. The sea’s power is pictured in divided panes of varying deep blue intensities that appear both as strong and as brittle as stained glass. Her practice differs from that of Aubusson weavers and Christine Pradel-Lien in that she uses a vertical, haute lisse (high warp) loom that measures 2.5 x 2.6 metres, as it provides her with more visibility and freedom. However, she weaves from the back of the tapestry, monitoring her progress with a mirror. 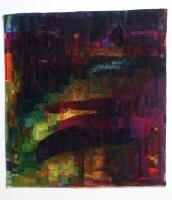 Other artist/weavers have set up their own studios and weave tapestries in a more experimental style. Liciers Angevins is a studio occupied by four weavers in Angers – Marie-José Chéret, Helène Delachanel, Michèle Le Ru and Martine Plait – who are dedicated to broadening definitions of tapestry by using textured yarns and unexpected fibres in their work. Some of these materials include various plastics and filaments, such as telephone wires, fashioned from and commenting upon the detritus of modern society. The work is often exhibited as three-dimensional installations. Supported and provided with a studio space by the city of Angers and its office of tourism, they have exhibited as a group since 1992. Happily, in recent years, newer studios have been established in both Angers and Aubusson, whose practitioners are young and determined to mark the medium with fresh vision that bodes well for the future, breathing new life into the oldest traditions. Cresside Collette has been a tapestry weaver for more than forty years. A foundation weaver with the Victorian Tapestry Workshop (now the Australian Tapestry Workshop) in Melbourne (where she worked for fifteen years) she has maintained her own weaving practice and exhibited consistently since 1971. 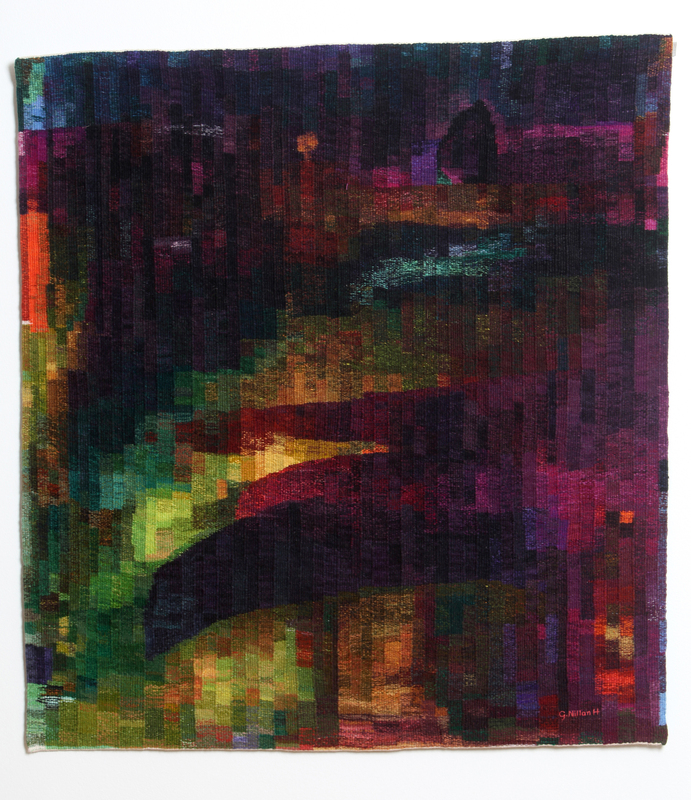 She taught tapestry weaving and drawing at RMIT University for 11 years and in 2011, designed her annual tour, Mastering the Fine Art of Tapestry, to view the best of the art form in France and the U.K. Cresside is currently working towards an exhibition of tapestries drawn from landscape in the country of her birth, Sri Lanka.